For the month of April, we will host "Blue Jeans For A Cause". All proceeds will benefit & help with a very special cause in our community. 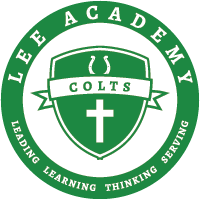 You may wear blue jeans with a LEE Academy T-shirt (only) every Friday for the entire month. Next week, you may wear blue jeans on Thursday since we will not be in school on Friday. You can bring $5 this Friday to your homeroom teacher or bring $1 every Friday. The Lee Academy Junior Class will host an Easter Bake Sale on Tuesday, April 11th from 4:30 p.m.- 6:00 p.m. in the Commons. We will have a large variety of delicious Casseroles and Desserts. Thank you for your support! We hope to see you all there. Young Life is selling Hams for Easter. You may pick up at the Expo between 1-5 on April 13th. Hams are $40 each. Support Young Life! Students in 9th, 10th or 11th grades interested in attending the Soil and Conservation Youth Camp this summer see Mrs. Antici for an application. Track Meet Tomorrow! Meet begins at 9:00! Track participants may wear uniform under warm-ups! We need more help! Please call if you can work. Even 1 hour is a huge help! Friday Juniors will be traveling to Civil Rights Museum in Memphis.